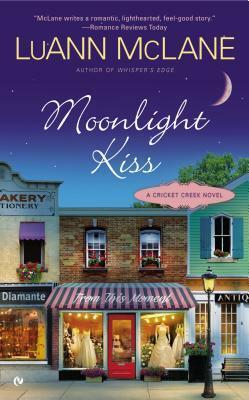 LuAnn McLean paints a lovely small town picture in Moonlight Kiss. She nails the charm, quirks, nosiness, friendliness, and sense of community you’d experience in a small southern town as you walk the streets of Cricket Creek with Addison and Reid. She fully embraces you in the feel and flavor of this small Kentucky town, a place I wouldn’t mind visiting if it actually existed. In addition to the sweet southern charm of the town, Ms. McLean writes engaging and sweet characters who’s chemistry you feel right from the start. Addison stumbles into Cricket Creek running from a tabloid feast fest of a break-up, and Reid is busy trying to help save the family farm. Both have sworn off relationships in order to get their heads start only to find them selves quickly failing in love. I found their story to be fun and sweet, if not entirely believable. There were no major hiccups in their story, and you know going in that Addy and Reid will have their happily ever after. The romance I was more interested in was that of Rick and Maggie. Rick is Addison’s almost father-in-law and Maggie is a local realtor who helps him find a a cabin to rent while he regroups and hides from the paparazzi. Their romance is so sweet and touching it was wonderful to read. Ms. McLean does a great job with these secondary characters, but like in the preceding book, Whisper’s Edge, just as we get to the end she drops them. There is sorta, kinda some closure at the end, but not really. There’s a great “I’m sorry” moment and then nothing, boom they’re gone. It aggravated me to say the least. If you are going to spend that much time investing into both relationships then BOTH relationships need to be given a conclusion. This oversight and the slightly unrealistic ending are the only things that brought my rating down. It could have been an A- book. Instead I’m giving it a B- rating because Rick and Maggie were totally short changed in my opinion. The book has tons going for it in way of dialogue great characters, beautifully written setting, and a totally awwww ending, but until the secondary romance gets its due I won’t be rating McLean’s books any higher. However, if you like small southern towns and sweet endings you’ll enjoy this book. I mostly did despite my issues.